The popularity of digital cameras continues to grow exponentially. They are now more powerful, feature rich, and affordable--turning digital photography into a mainstream interest. And with Photoshop Elements, Adobe has created the most popular photo-editing program on the planet. Learning how to work Photoshop Elements and manage digital photos can be a challenge for anyone just getting started--from the hobbyist to the pro photographer. With the latest Photoshop Elements 4 update, Adobe delivers a powerful new program that provides photo editing and organizing functionality with improved performance. The updated version also includes new, more intuitive features that are streamlined and easier to use--when the photographer has the right learning tool in hand. Once photographers learn how to edit their photos successfully, they'll also learn how to post them online or upload them to the Kodak EasyShare Gallery for use in creating personal mailing lists, post cards, calendars, and much more. Photoshop Elements 4: The Missing Manual, is for any photographer interested in learning the right editing techniques for producing and sharing beautiful digital photography. 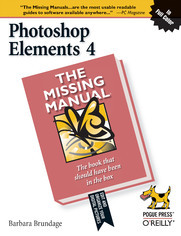 Photoshop Elements 4: The Missing Manual covers the Windows version of the software only. When we published the book, there was no Mac version of the software (as there is now), and for various reasons, we've been unable to update this edition to include the Mac version. Nonetheless, if you're on a Mac, you can use this book. Just substitute Command for Ctrl, and Option for Alt whenever you see keystroke shortcuts, and about 98 percent of the Editor functions will work the same. The sections on the Organizer only apply to Windows because the Mac version has no Organizer. 8.1.4.1. Choosing bit depth: 8 or 16 bits?